This year the i-STEM Institute at North Idaho College (NIC) in Coeur d'Alene will be June 17-20. Over these four days, participants attend a workshop strand, participate in general sessions with keynote speakers and network with other educators. Participants leave with a kit of materials related to the workshop strand they attend, ready to implement what they have learned into their teaching environments. This professional development opportunity is open to formal and informal educators. APPLICATION TO ATTEND IS CLOSED. Successful applicants will be notified in early April by STEM Action Center. Have Questions?? Contact the i-STEM Coordinator, Kaitlin Maguire, at istem@stem.idaho.gov. Cost: After notification of acceptance, participants pay a registration fee following the guidelines below. Agendas and Keynote Speakers coming soon! Participants that travel >25 miles to attend the closest institute are eligible to receive a travel reimbursement stipend, following the guidelines below. Distance is measured from the participant’s organization (school, library, afterschool program) to the closest institute location. Participants must attend all four days of the institute to receive a travel stipend. The stipends will be distributed after the institute. Only public Idaho formal and informal educators are eligible for travel stipends. Formal and informal educators serving Idaho PreK-12 students. Indicates this strand is appropriate for informal educators. Note: Kit contents and field trips are subject to change. Learn how to introduce coding to your primary age students! Participants will participate in several activities (known as unplugged activities) to learn how students can practice these foundational tasks to establish the initial understanding of how coding works. Participants will then learn how to teach students to code using paper mazes, Lego mazes, and Osmo materials using tiles and apps. Then participants will learn about the Dash Robot, one of the most engaging ways to inspire students to learn code! There will be tasks and challenges as you learn how to write code to program the Dash Robot to play a xylophone, sketch shapes, speak, and maneuver throughout the room just to name a few. You won't want to miss this exciting strand as you bring home materials ready for use in your primary classroom. This session is intended for teachers who have had no prior experience with teaching primary age students about code. Field trip is TBA. 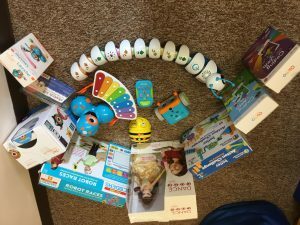 Kit: Wonder Workshop Dash Robot, Code and Go Mouse, Let’s Do Code 50 pieces activity set and more! Subjects: STEM, Arts/Humanities, Drones/Robotics/Virtual Reality, GATE Instructors: Breland Tommerup and Melanie Gillette Are you ready to start a Makerspace in your school? We can help! Our Makerspace has been up and running for the last two years, and we want to share our ideas with you. We will share unique and ready-to-use resources and lessons in each of the STEAM categories. Whether you’re looking to create Makerswall, Makerscart, or an entire Makerspace, after this strand, you will head back to class next fall with a loaded STEAM kit to get started right away! We will also provide some insight on grant writing and how to affordably acquire more STEAM resources for your students. Field trip to GIZMO Makerspace Kit: Cublet Kit, Lego Simple Machine, Water Color Pencils, Escape Room Voucher. Kit: The kit will include an Ozobot, ultraviolet beads, a handheld ultraviolet light, pattern blocks, and four books - Innovator’s Mindset: Empower Learning, Unleash Talent, and Lead a Culture of Creativity; Designing Groupwork; MAKE: Paper Inventions; and 5 Practices for Orchestrating Productive Mathematical Discussion. Inspire, Ignite, Invent! Inspire your students to apply STEM concepts as they design innovative solutions to real world problems. Ignite their curiosity with lessons designed to awaken your students’ inventive spirits. 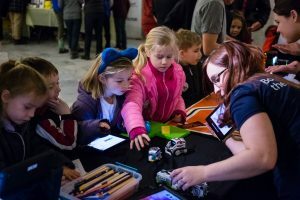 Develop example inventions for your students as you experience first-hand how to implement the Invent Idaho student invention convention in your own classroom, school, or district. 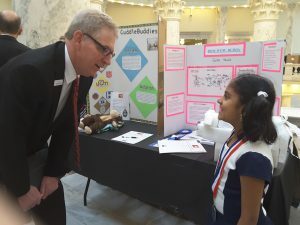 Did you know that Invent Idaho students earned more major awards per number of participants than any other state at the 2016 National Invention Convention in Washington, DC and brought home 11 major awards out of 21 student attendees, including Most Innovative invention! Discover how our very own Idaho young inventors have appeared on the Tonight Show with Jimmy Fallon, Disney’s ‘Figure It Out’ television show, the Oprah Winfrey Network, and Ellen! Kit: Aerogel (Guiness Book of World Records lightest weight substance on Earth, an amazing invention in the field of chemistry), classroom set of Private Eye Loupes, an owl pellet for participants to dissect, Intelligent Hydrogen Fuel Cell kit. Participants will take a deep dive into and explore how our new Idaho Science Standards can help prepare our young scientists to change the world. 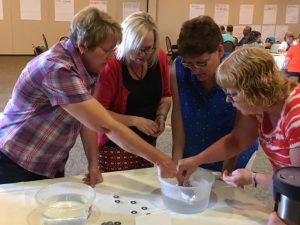 By taking a deep-dive into Project-Based Learning pedagogy using backward design models, participants will explore and design lessons and units to implement key instructional shifts to meet the new Idaho Science Standards. With guided instruction participants will have time and support in the design of lessons and units, build kits, and plan literacy and assessment strategies, to help foster passion for science and engineering through inquiry methodology in their own classrooms. Field trip to the lake and the local waste water treatment plant. Kit: Participants will receive a NSTA membership and funds to support a project-based learning unit in their own teaching environment. Participants can purchase two graduate level professional development credits from Boise State University ($60/credit) for attending all four days of the i-STEM institute. Information and instructions on how to sign up for these credits will be provided during the institute. An additional third credit can be purchased upon completion of a follow-up assignment in Fall 2019 (see below). Fall 2019 Follow-Up Assignment – This assignment will involve developing a content standard lesson plan based on the content learned in the workshop strand you attend. The details of this assignment are TBA. Information about the assignment will be discussed during the institute.